Report by Des Brennan, all photos by author. Twice a year the RAF holds Combined Qualified Weapons Instructors Courses (CQWIC) for aircrew who have been training at their respective fast jet Operational Conversion Units (OCUs) as Qualified Weapons Instructors (QWIs). These are already highly experienced on type and return to their operational squadrons well versed in the latest tactics and operational doctrine. The CQWIC last for two weeks in June/July and November/December and involves Combined Air Operation (COMAO) exercises being flown Tuesday-Friday in week one and Monday-Thursday in week two. Overseen by the Air Warfare Centre these daily exercises cover a wide range of scenarios for packages of 30-40 aircraft striking a variety of targets to accomplish their exercise goal. This serves a dual purpose of allowing students to plan and execute operations using current tactics which can themselves be refined through such use. Use of Rangeless Airborne Instrumented De-Briefing System (RAIDS) Pods which fit standard Sidewinder launch rails allows real-time monitoring and post-exercise debriefing. In addition to the OCU aircraft types ( Tornado GR.4 from XV (R) Sqn. ; Tornado F.3 from 56 (R) ; Harrier GR.7 and T.10 from 20 (R) Sqn. and until recently Jaguar GR.3 and T.4 from 16 (R) Sqn. ) other RAF and Royal Navy units provide additional fast jet and force multiplier support. Non-UK participation has included USMC F/A-18s, Norwegian F-16`s, French and NATO AEW and most recently USAF F-15s. In recent years most CQWIC events have been held at RAF Leuchars in Fife which is roughly mid-way between the low flying areas and ranges of the Scottish Highlands to the north and Scottish Borders and Northern England to the south which avoids long transit flights and allows operating aircraft to take off almost straight into their exercise roles. The exercise area is selected daily depending on the weather and the relevant task allocated to the CQWIC Students who then have to prepare their operational plan, conduct general and formation briefings prior to a preset launch time, usually in the early afternoon. To limit noise nuisance in the vicinity aircraft formations taking part launch in fairly rapid succession over about an hour with landings being even more concentrated. Tornado F.3 from 56(R) Sqn. (OCU) with support from 25 Sqn. which also operated aircraft from now disbanded 11 Sqn. as well as participation by Leuchars based 43 Sqn. Tornado GR.4 from 9, 12, 13, 31 and 617 Sqns. but none in the markings of the OCU (XV (R) Sqn.). Harrier GR.7 and T.10 from 20(R) Sqn. (OCU) with support from 1 and 3 Sqn. AEW was provided by an E-3D Sentry of 8/23 Sqn. and Sea King AEW.7s of 849 Sqn. Threat simulation was by Falcon 20s of FRA along with Hawks from 100 and 19(R) Sqns. A Hercules C.3 from the Lyneham Transport Wing and a Leuchars based Gazelle AH.1 of 3(V) Flt. Army Air Corps. Non-UK participation from five F-15C and one F-15D of the Lakenheath based 493rd Fighter Squadron. Included among these were the 13 Sqn. Tornado GR.4 in 90th. Anniversary markings and a 25 Sqn. 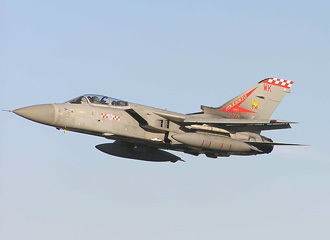 Tornado F.3 in the new dark grey colour scheme. The latter subsequently suffered a systems failure and returned during the mass launch with arrestor hook down but rolled to a halt without engaging the arrestor cable and was quickly and efficiently made safe and removed without delay. With thanks to Flt. Lt. Wardlaw, Corporate Communications Officer, RAF Leuchars for arranging the photo-opportunity.